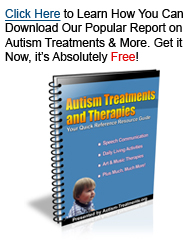 One of the main struggles for children with autism is being able to communicate with their parents or whomever it may be that they need something from. Without the ability to communicate the child can grow frustrated and begin to withdraw, lacking the ability to express certain needs. With a picture exchange communication system you are allowing your child with autism to have some power and independence by being able to directly address their needs and concerns. The way this PECS system works is the trainer or medical professional will give the child with autism a specific group of pictures that will help them identify everyday wants and needs. Started by the Delaware Autistic Program, this system allows the child with autism to give an adult or professional a picture of something that they want or need. The benefit being that the child gets what they want and need while showing them the real value of communication. Many support this treatment and you won’t find just a ton of detractors and critics of this therapeutic process worldwide. However, if it doesn’t work for your child it is not the end of their, or your, world. There are other treatments to try and you never know which one will work for your child until the right one comes along. Try not to compare the success your child to that of other kids, yours is unique and requires his or her own intervention plan.